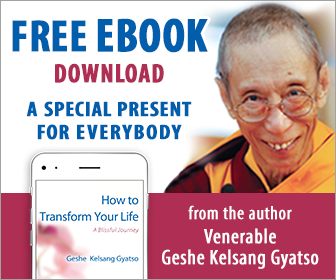 Buddhism is Buddha’s teachings and the inner experiences or realizations of these teachings. These have a timeless and universal relevance and can be practiced by anyone in any culture, regardless of race, gender, or age. 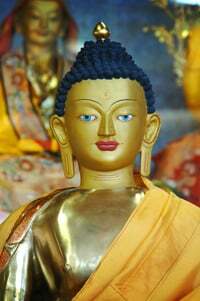 By practicing Buddha’s teachings, or Dharma, we protect ourself from suffering and problems. All the problems we experience during daily life originate in ignorance, and the method for eliminating ignorance is to practice Dharma. Practicing Dharma is the supreme method for improving the quality of our human life because the quality of life depends not upon external development or material progress, but upon the inner development of peace and happiness. Buddha first gave his teachings over two and half thousand years ago. Since that time they have been preserved in a pure form and passed down from Teacher to disciple in an unbroken lineage that is still alive today. Thanks to the kindness of these previous Teachers, we are able to listen to and practice exactly the same Dharma as Buddha originally taught. Use the menu to find out more.